3GPP Release 10, better known as the first release of LTE-Advanced, has added several features that impact uplink transmission. 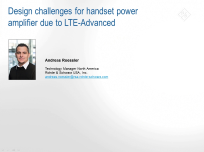 This creates some design and test challenges for power amplifiers that go into modern smartphones or tablets. This webinar discusses the added features, analyzes design implications and explains how to overcome these challenges. It also describes related test and measurement tasks and shows how leading signal generator and signal analyzer solutions from Rohde & Schwarz can be used to master these tasks very easily.